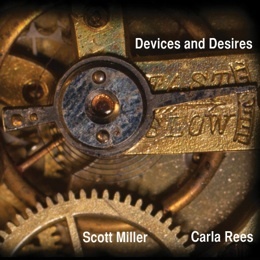 Back in November 2011, alto flautist and rarescale director Carla Rees gave the first performance of Anterior/Interior by Minneapolis-based electroacoustic composer Scott Miller. The next day they went into the studio to record the work, and finished so quickly that they had two hours spare. They recorded some improvisations – and the result is this CD. Two of those improvisations are semi-structured, the other three are completely free. In the Book of Common Prayer “The devices and desires of our own heart” are occasions for sin. As a virtue, they are the basis of Miltonian free will. For an album of improvisations between flute – one of the most light-footed of all instruments – and computer the tension between freedom and constraint is presumably part of the thinking here. Anterior/Interior begins with the flute acting as a little more than a sound source, from which Miller’s computer analyses and resynthesises an array of textures. Slowly, though, the flute part takes on a character – lit by its electronic backdrop – as a lone keening voice, which becomes a song of increasing intensity until a swift dénouement. It’s a likeable introduction, and sets a lot of the sonic template for the rest of the album. However, I much prefer the improvised tracks. Here Miller and Rees take their instruments, and their strange, asymmetric partnership into more interesting territory. In Beauty is Eternity Gazing in a Mirror, Rees’s microtones are transformed into squelching puddles, whooping insects and rainforest hum. (There is an air of David Tudor to a lot of the electronics, in fact.) Omaggio a 1961 explores drier reverb territory, while Haiku, Interrupted teases at decaying resonances, fading finally into the sound of a wheezing, broken children’s toy. The stand-out track is possibly Seriously, this is a commitment, which blends a quirky electronic bleep-beat with occasional Coltrane-esque howling from Rees. Here, more than in any other track, Miller and Rees accentuate the differences between their instruments (rather than their synthesis), and it leads to some of the most fruitful points of dialogue. Devices and Desires may be ordered through the rarescale website and elsewhere. It’s good to read a review of Scott’s work here – his pieces are always highlights of the Twin Cities new music season, and his skill and generosity as an improviser deserve more recognition.